Excellent condition. Froward master bedroom with Queen bed. Rear bunk house with three large bunks. TV in living, master and bunk. Outside kitchen with stove, microwave, fridge and sink. Outside TV. Bike carrier. Sleeps 9. 2013 Sprinter Copper Canyon Edition One owner very clean like new Has outside kitchen 3 slides with a bunk house. 2011 - 31 ft zinger with front master bedroom and rear bunkhouse. Double slide, one in main area and one in bunk house. Full bath with separate entrance. Outside bar, with fridge and sink. Solid Fibreglass exterior. 2009 30TBR Conquest Camper. Spacious double slid camper with 1 private queen size rm located at front of camper and a private bunk house twin over double located in back of camper. Great family camper. Lots of storage and cupboard space. Everything works great. Reason for selling, purchasing a cabin. No emails please. Call if you have any questions. Well cared for travel trailer in Excellent condition. Used at a seasonal site. Sleeps 10, queen bed up front and bunk house at the rear. Ready to go for May-24 weekend. If you have any questions or want to view please contact via email or phone. Thanks for looking. 2011 324FWBHS Keystone Copper Canyon. Bunk house model. Original owner & in excellent condition. Stored winters with regular maintenance. Has to be seen to be appreciated. Parked on seasoned site. Rust checked yearly. Out of storage 1st week in May. No lean on vehicle from any financial institution. A 2011 KZ 32 BH with 2 slides. This trailer has an outside kitchen and shower, large bunk house with slide and a queen size bedroom. It is a lite weight trailer and very easy to tow. Pictures available upon request. NEW PRICE $25,700 - was $ 26,200 OBO. Hideout 2014 31RBDS - The trailer is in excellent condition has two slides, bunk house in rear, front queen bed, entertainment unit, u-shaped dinette, outdoor kitchen, LED lighting under awning, 3 burner stove, microwave, fridge, bathroom with shower/tub and toilet. 2017 SHASTA REVERE 33TS This is an excellent family camper with a large bunk house in the rear and a queen bed up front. Lots of storage space for all of your camping supplies. Three power slides and a power awning. Camper is currently in Brigus Junction. Please email if interested. Financing available. 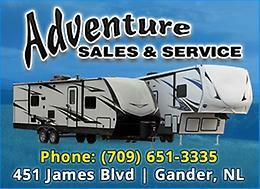 Beautiful 29' 2012 Surveyor Eco Lite Travel trailer. Excellent condition, pet and smoke free. Ultralite and easy to tow. Features include: Outdoor kitchen 3 bed bunk house in back Queen bed U Shape bench table Bath tub Power Slide out Power Awning AC and Furnace Please contact for viewing or for more information.